Posts about things you can make out of rocks or things you can make that look like rocks. A while ago, we went over to Mr. and Mrs. Snow’s house and learned how to make cabs. Dan provided the equipment and Connie provided a delicious lunch and took photos so I would have something to write about. Everyone had a lot of fun. The Spring 2017 Gem and Mineral Show was very successful. The parking lot was filled to capacity and we made over $3000 for the scholarship fund. I think it helped that it was so cold on Saturday, because people wanted to do something indoors. Here are some of the highlights. We hope you are having fun at the show. Don’t forget to set your clocks forward 1 hour for Daylight Savings Time. Don’t forget to set your clocks back one hour tonight for Daylight Savings Time! Otherwise, you might accidentally come to the show an hour early. Speaking of that, I wonder why the gem shows always seem to fall on Daylight Savings Time weekend. This is what happens when you ask a geologist to bake a cake. http://blogs.agu.org/mountainbeltway/2011/01/24/east-wall-of-bakers-quarry/ has a very funny description of the quarry and how it was formed. Make sure you read the whole thing! Historical records indicate that quarrying operations began in earnest around 9:30pm, although there is anecdotal evidence of small scale nibbling, particularly in the Strawberry Granite, prior to that time. Though only crumbs were removed, a few locals reported their findings to others. Resulting hype and rumor-mongering built up public anticipation to a frenzied hum. When the echoes of dinner had faded, industrial-scale excavations began at Baker’s Quarry. The real Baker’s Quarry is a mine in Monroe, North Carolina, also known as Martin Marietta Materials. This is what it looks like. We interrupt the Spring Gem and Mineral Show to remind you to set your clock forward one hour tonight for Daylight Savings Time. This clock is from the collection of David Reed. It contains agates, Apache tears (obsidian), a craft store clock kit, and lots of resin. It looks pretty good with his other rock clock. The MO DNR website has these cute little geologist paper dolls (PDF) to download, print, and assemble. Here’s mine. If you make one, send it to me and I’ll post a picture of it. Tanya at Dans Le Lakehouse has a neat collection of minerals from Canada that she’s had since childhood. She wanted to enjoy her shiny pretty rocks, but they were stored in an opaque cardboard box. One day, she found this glass box that was the same size as the original box and lined it with felt. Then she arranged the specimens by color and hid the name and locality tags underneath the felt. I don’t know why she thinks this is nerdy. Now the rock collection sits on her husband’s desk, adding color to the room. Read her blog post for more details. 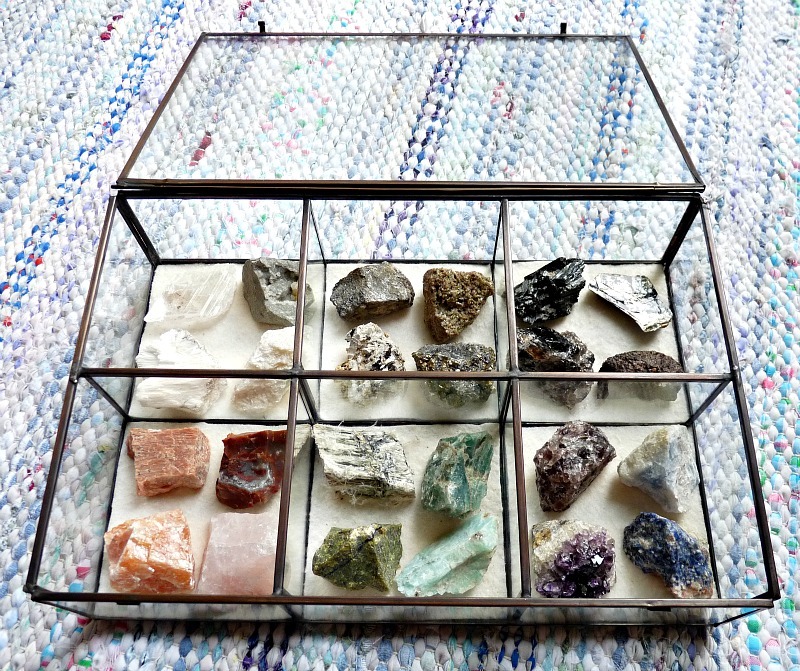 What a neat way to display a colorful set of minerals! I think the sodalite and the red jasper are the most eye-catching. Which mineral is your favorite? 1 bag of oval-shaped or circular cookies. Cookies that do not already have icing work best. Several types of cookies can be used, if you want to show variety. Several tubes of icing for decorating. Large tubes and small, detail tubes can both be used. 1. Place undecorated cookies on a plate or paper towel. 2. Decorate cookies using tube icing. Try to divide the cookies into three parts. You can spread icing on the top third and bottom third to model the head (cephalon) and tail (pygidium) of the trilobite. You can also divide the cookie into three parts along the long axis and spread icing on both sides, leaving the middle strip bare. This models the three longitudinal lobes of the trilobite. You can use small tube icing to make segments across the cookie, or bumps, or spines. Use your imagination. 3. Finish by placing two candy eyes on the head. You can use a dab of icing as “glue” to help hold the candy eyes down. If the eyes don’t stick, it’s okay; some trilobites lacked eyes and were blind. 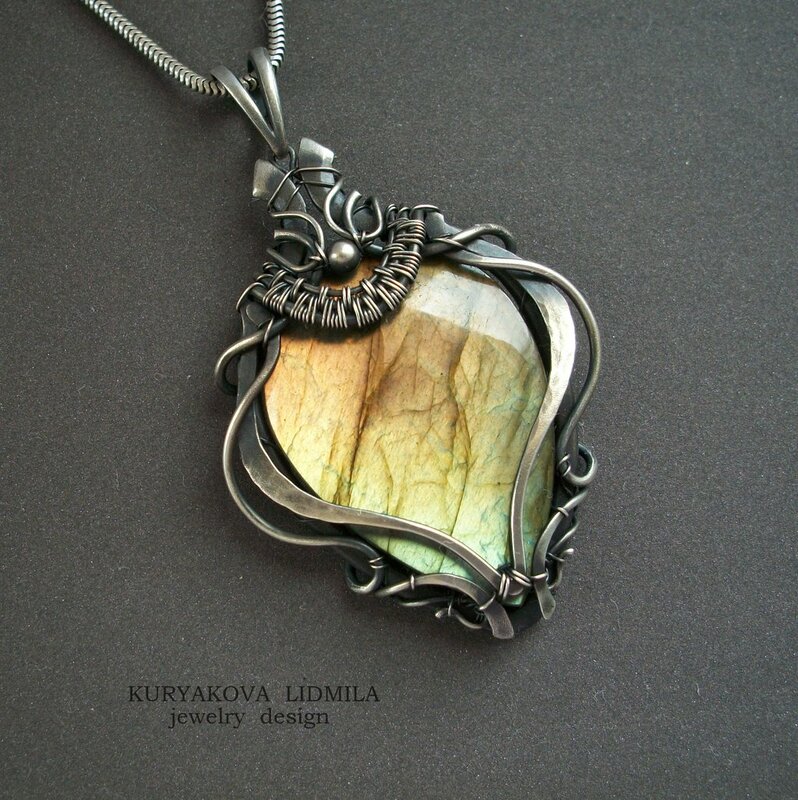 A beautiful piece of labradorite in an equally beautiful setting by KLwiredream. I wish I could wire wrap this well.